Extensively-equipped X370 motherboard (ATX) from MSI, 2× PCIe 3.0 x16 (x16/x8) / 1× PCIe 2.0 x16 (x4), 2× M.2 & 6× SATA 6G, 3x USB 3.1 / 8× USB 3.0 / 6× USB 2.0, max 64 GB RAM at 2.666 MHz Motherboards with the AM4 socket serve as the platform for the AMD Ryzen (Summit Ridge) quad-core, hexa-core and octa-core CPUs as well as "Bristol Ridge" and "Raven Ridge" desktop APUs from the A-series with integrated GPUs unlike the old Athlon X4 which came without an iGPU. The advanced AMX X370, B350 and A320 chipsets are aimed at the enthusiast, mainstream and entry-level segments coming with an abundance of modern I/O interfaces and connectors for hardware peripherals, while additional data links are provided by the GPU/APU. The MSI X370 Xpower Gaming Titanium is an ATX motherboard and comes with two lightning-fast PCI-Express 3.0 slots, of which one comes with a full 16 lanes and the other with 8. Furthermore a PCIe 2.0 slot with a 4x interface as well as three PCIe x1 slots are available for additional expansion cards. Up to 64 GB DDR4-RAM can be installed into the four RAM slots, which in turn operate at a maximum of 2.666 Megahertz. range of internal connectors includes, among other things, two USB 3.0 headers and two USB 2.0 headers for a total of four ports respectively and a USB 3.1 header for an additional port. 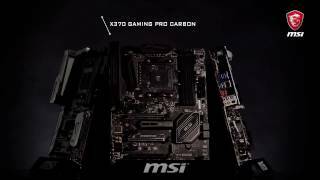 A further highlight of the MSI X370 Xpower Gaming Titanium is to be found on the reverse of the motherboard, specifically the fact that the motherboard includes a USB 3.1 Type C connector and a USB 3.1 Type A connector. This new kind of USB Type C port is particularly thing and can finally be inserted in either direction. USB 3.0 or USB 3.1 Gen 1 can reach a maximum transfer rate of up to 5 Gbit/s per port. A special feature of the board is the integrated MSI "Mystic Light" RGB-LED lighting, which enables lighting on the VRM- as well as chipset cooler and on the PCB itself, including coloured lighting in all colours that can be controlled via app. Other refinements of the MSI X370 Xpower Gaming Titanium include the "Audio Boost 4" functionality with Nahimic Sound Enhancer 2, the stabilising "Steel Armor" and the Click BIOS 5 for simplified fine-tuning of the system. Last but not least, five fans with 4-pin PWM connectors as well as a pump for water cooling can be connected directly to the board. On the reverse of the motherboard is located the I/O shield which provides access to further devices and components via USB 3.1, 3.0 and 2.0, Gigabit LAN, universal PS/2 or five audio jacks for connecting 7.1 sound to the MSI X370 Xpower Gaming Titanium. Furthermore the monitor outputs of the integrated APU-GPU (optional) include two monitor outputs: HDMI and DisplayPort. More links for "X370 Xpower Gaming Titanium AMD X370 (Socket AM4) DDR4 ATX Motherboard"
On a plus side, it boots and the system runs. The Flashback+ feature was nice when the BIOS was absolute unstable. The board would not boot out of the box at all, only after I used this feature to flash it to 1.31. There are several issues with this board. The BIOS and especially memory support is much worse than from other vendors, but also the parts itself do not fit the price. What tops it, the usb ports do not fit properly, for example the usb receiver for my headset does not physical fit into any of the ports. I have to use a usb extension cable, because it goes not deep enough to make contact (modern Logitech wireless headset). I extra bought 2x16GB Vengence for 3GHz memory support and the maximum I can run those is 2133MHz since day 1. The front USB connector does permanent become loose and falls out of the socket as soon as you touch it, two pins immediately broke off and I lost one front USB port. There are few options in the AMI BIOS to tweak something, like to just control vcore voltage, needs you to set all voltages manually. X-AMP (some auto-tuning) makes the system not boot. I can only run stock (means memory etc. underclocked) settings or not at all. It was an adventure into MSI and AMI BIOS, but I will go back to Asus with the next board.